Although the 3D printers are getting cheaper and many models were released to overcome the price barrier with cheap 3D printers. The quality and skills required to run the 3D printer is not granted. Very few cheap 3D printers have proven quality output and many happiest are still lack the experience to run and maintain the 3D printers. Unless you have the required experience, it would be challenging to own a 3D printer. 3D Hubs is the largest online 3d printing community that connect 3D printer owners and clients on multiple level of sharing knowledge and resources. The company that is based on New York and Amsterdam is a private held company backed by Balderson Capital and Dutch Investors DOEN and Zeeburg. Currently, the 3D Hub connects more than 12,000+ printers from 140+ countries. The community is simply based on 3D printer owner and clients. All you need to do is to search based on your city in order to find a map with the available 3D printers in specific area, information about the 3D printer and other client rating for the 3D printing service. The 3D Hub Trends page indicate significant increase in the 3D printer listing from 2013, where there was only 55 3D printer available to provide their services. In 2015, more than 12,000+ 3D printers were added to the system. Most of theses printers are located in North America, Europe, Asia Pacific and South America. The 3D printing service range between scaling models, prototyping, art and fashion, hobby and house holding models. The top cities with largest 3D printer provide include New York with 202 3D printers, Milan with 170 printers, London with 145 printer and Los Angeles with 143 printers. There are wide range of 3D printer models available on the 3D Hub database including Replicator 2, Ultimaker 2, Prusa i3, RepRap and others. The smart rating system attached to each 3D printer helps clients to learn more about the previous printing experience with each 3D printer and have an idea about the printing quality through photo examples of the results. In addition to the 3D printer locator, 3D Hub extends the user knowledge through 3D Hub learn that provide tutorials and tips to use the 3D printing service and the platform. 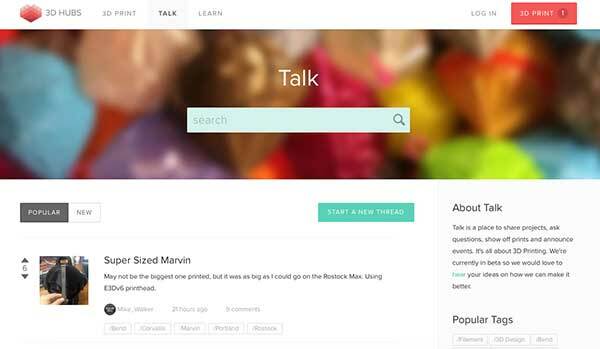 Recently, 3D Hub launched the Talk section that allow users to ask questions, share experience and communicate with each other through sharing their experiences. In the Talk section, 3D Hub provides updates and information about the upcoming events and news. This helps users to join real events in addition to the online communication platform. The 3D Hub contributes the 3D printing industry through connecting clients with 3D printer owners. The 3D printer owners can make profit by operating their printers for other clients and clients use the 3D printers near them for research, prototyping or production level.